Frog gigging is a great night-time, summer activity when the days are too hot for anything else. 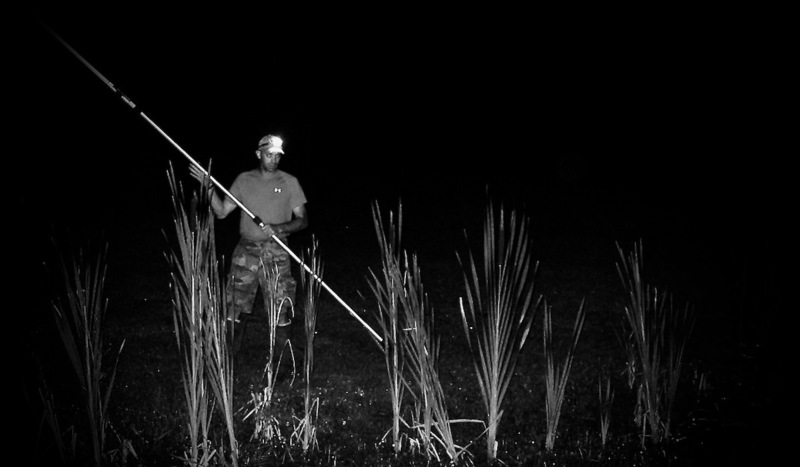 Get frog gigging basics, a gear list and tips to clean the bullfrogs. August. It’s a mixed bag for hunters and anglers. You’re in between seasons. Land managers are up to their necks fighting weeds in summer food plots, and for those who like to fish, August is often no good. The water's too hot, the fish are too lethargic. That’s where frog gigging comes in. Sure, some go in the spring when the bullfrogs are singing. Others, like many people in the deep south, hit the farm ponds and swamp lands in late summer when the fishing is played out and deer season isn’t yet in. Outside of a body of water, you don’t need an awful lot to gig frogs. It’s an inexpensive form of hunting, and the hunting season for most states can last for half the year. Spotlight. You’ll need a high-powered spotlight to scan pond and river banks. The idea is to a) identify the bullfrogs, but also b) to freeze the frog with blinding light. Browning makes the High Noon, a solid, affordable light that sells for around $80. Cigars or mosquito repellant or both. This is optional and, obviously, not recommended for kids. But cigars do well with keeping the misquotes away, and when you’re in mud flats on muggy nights, you can’t beat the effectiveness of this old-time repellent. Also, for those who don’t like cigars, you might try a cigarillo. They're often sold with a plastic tip, so you're not spitting tobacco. This is also handy if you're on a frog-gigging date. Keeps your teeth free of tobacco specks. These cigars are thin, but can still get the job done. Of course, there’s always store-bought mosquito repellent if you want to be basic. Cigarillos often come in these nifty little tins. They're perfect for storing flies for fly-fishing or split shot sinkers once you're done with your smokes. Frog Gig Spears. With gigging, you need to get it right. Once a frog is gigged, the frog must be taken so no wounded frogs are left behind. Also, if gigging from a kayak, canoe or paddle board, you’ll need to use as much finesse as possible once you begin closing the distance between the gig and the frog. Creep in and use the natural current entirely if possible. There are spears listed on Amazon for as little as $8.99. Use an old broom stick to mount the gig to end. Or maybe you've got an old hoe or shovel handle laying around. Those work too. Head lamp or wrist light. You’ve got your spotlight, but a head lamp is useful. It's possibly critical. If on foot, expect to be stumbling around in the mud flats and tall grasses without one. If you’re gigging by boat, getting in and out and managing your gear while on the water is aided by a hands-free light. Surefire’s line of wrist lights aren't your least-expensive options, but they're typically more secure than a head lamp and, once you own one, you’ll find all sorts of uses for it well beyond whatever hunting adventures and other outdoor activities you use it for. The 221 Rechargeable Variable-Output LED WristLight retails for $169. Surefire's 221 Rechargeable Variable-Output LED WristLight. How Do you Clean a Frog? For step-by-step instructions and images to demonstrate each step (like the instructive image below), you'll want to read chef Hank Shaw's "How to Clean a Frog," post, which can be found on his website Hunter. Angler. Gardener. Cook. “A knife and some good catfish skinners are the only tools needed. If it’s a smaller bullfrog, just skin him from his waist down, separate the legs and cut off the feet. If he’s a giant, you can skin him from the neck back, much like a squirrel." For those who don't hunt and rarely fish, but find themselves motivated by locally sourced meat (i.e. those on the Paleo Diet and/or locavores, for instance), frog gigging is an easy, low-barrier-to-entry way to acquire your own meat. In this case, the meat is from a bullfrog, which is outside of what many locavores may have in mind. But frog gigging still presents an opportunity to experience the process of hunting your own meat, cleaning it and prepping it for the dinner table. Not to mention, the meat from a bullfrog is pretty amazing. But not everyone lives in a rural area or has property with a farm pond. Don't be discouraged. Rivers and lakes on public land are great places to scout for gigging bullfrogs. (Rain frogs ain't gonna cut it.) Another idea, which may be unconventional, is the neighborhood pond. So many planned neighborhoods now have ponds that allow fishing. Find out if residents can also go frog gigging on these bodies of water. Keep in mind, it's critical to check your state's regulations for gigging bullfrogs in your area. This information can be found on your state's wildlife agency website. Bonus #1: Where Should You Hit a Frog? Anywhere you can stick 'em. Watch this video from the Missouri Department Conservation to see how it's done. Frog gigging is about collecting legs for a nice, homegrown supper, but it’s also a fun activity to do in the dog-days of summer when the weather is only fit for nighttime activities, movies or swimming. Kids like creeping through the dark with spotlights. They’re stalking, yes, but it’s not on such a high-risk, high-reward level as big-game hunting. Plus, like other types of hunting, it’s a test of silence for kids. But it’s a silence that's often achieved easier. When hunting for deer, you’re quiet in order not to be heard. That’s a tougher sell for active little boys and girls. On the other hand, frog gigging requires silence so the frogs can be heard. You're basically waiting for the bullfrogs to tip themselves off. And and that can be a lot more fun. This post is part 1 of a three-part series on frog gigging. Part 2 offers tips and benefits to frog gigging by kayak or paddle board. Part 3 explores bullfrog basics and explains why frog gigging is good for amphibians.